distance where Stubbs places us. Even when the gentleman owner comes by (below), everyone seems contented. It’s certainly not the more textured view of that world that we get from Henry Fielding’s Tom Jones, (1749) for example. But then it was the gentleman owners who were buying Stubb’s paintings, so very likely intimations of social discontents would have been unwelcome, even if Stubbs had been inclined to make them. 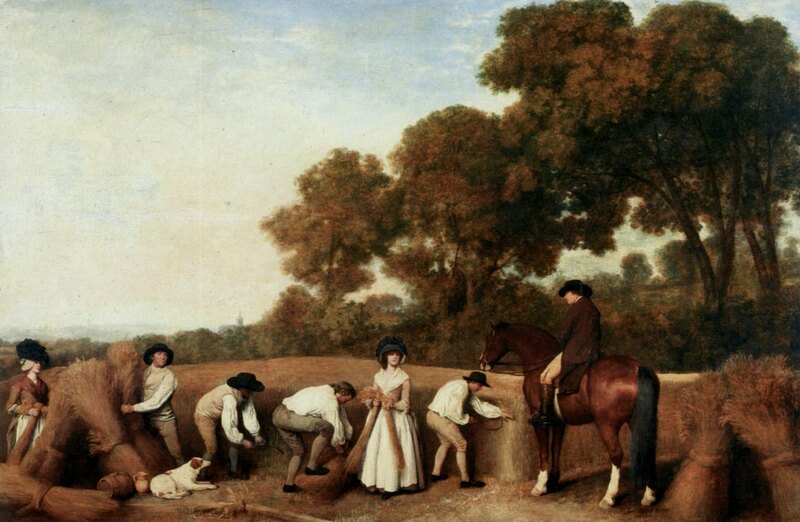 Instead he sticks to his wonderful trees and skies, gives special attention to the horses that made his reputation as a painter, and places a handsome frieze of clean, diligent, well-dressed workers across the foreground. Interesting, in light of Stubbs’ apparent social conservatism, is his formal freedom. 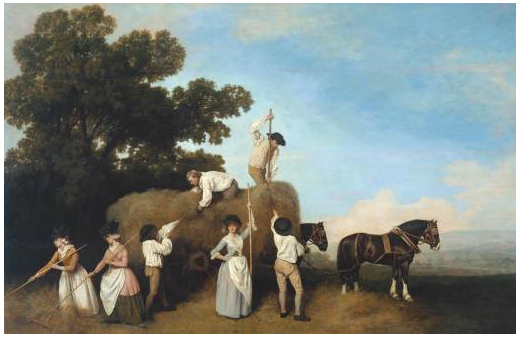 In ‘Harvest’ the trees are painted in the rich light-and-shadow of late afternoon, while the workers and their sheaves of wheat are in a flat studio light that lets Stubbs use their light-toned garments, and especially the whites, as flat, decorative shapes set off with strong, improbable shadows. The horse meanwhile, gets the full treatment: dark blacks, intense reds that rhyme the red in the trees, white legs to carry along the workers’ frieze, and fuller modeling (notice the glistening rump) than anything else in the painting. And notice the man and woman on the far left: the line of trees slopes down to them, but is intercepted by their sheaves, and stopped dead by her black hat and white scarf and face. And they are looking back at the gent. Our eye, having moved along to them, now follows their gaze back to the center and to the white-clad woman who stitches foreground, middle, and backgrounds together, and holds it all in stillness.